The guitar is a musical instrument, so its goal in life is to make musical sound. Music is the arrangement of tones into patterns that the human brain finds pleasing (or if not pleasing, then at least intriguing). A car wash dryer is industrial machinery, with the goal of performing a task within a production process. Rarely does the human brain perceive audible signals generated by machinery as pleasing. That is why manufacturers of industrial machinery work hard at keeping down the noise levels emanating from their products. For this same reason, regulators take an interest. Tonal noise, i.e., sound at a single tone, can be particularly annoying. Planning authorities have begun targeting specific tones in some car wash markets with the result that equipment can be deemed non-compliant even if the average decibel levels meet requirements. To better understand, let’s start at the beginning: “What is sound? What is noise?” Sound is defined as any pressure variation in air, water, or other fluid medium, which may be detected and processed by the human ear. For our ears to detect it, a change in pressure has to be strong enough to move the eardrums in our ears. The more strongly the pressure changes, the “louder” we perceive the sound to be. For our ears to be able to perceive a sound, the sound has to occur in a certain frequency range. At birth, the audible frequency range is 20 Hz to 20,000 Hz. Generally speaking, the average audible range in humans is from 30 Hz to 17,000 Hz. Sound pressure wave forms below and above this range are described as infrasonic and ultrasonic. Infrasonic sound is experienced as a flutter while ultrasonic sound produces no sensation of hearing. Noise is unwanted sound, which may be hazardous to health, interfere with speech and verbal communications, or is otherwise disturbing, irritating, or annoying. The distinction between sound and noise depends on your perspective: there is the signal you want and the signal you don’t want. Sound would be the signal you want, and noise the signal you do not want. Noise is characterized by the way in which it varies over time. It is usually made up of a wide range of different frequencies. The spread of noise energy across the audible frequency spectrum (about 20Hz-20kHz) is one factor that helps to make it identifiable to the human ear. But how do we determine the nature of the noise using tonal noise analysis? A tone generally refers to a sound that repeats at a single specific frequency. Sound is a general term, but would usually be used when you are talking about a single tone or a very small collection of related frequencies. Sometimes a noise source will emit noise that is concentrated in a narrow part of the spectrum or contains a high proportion of energy at a single frequency (a pure tone). Tonal noise is generated by rotating equipment at a given, audible frequency relating to the rotational speed of the shaft and, in this case, the number of fan blades. The alternative to a tone is sound energy from a combination of hundreds or thousands of random frequencies. We refer to these random-combination sounds as noise. When you hear the sound of a river, or the sound of wind rustling through leaves, or the sound of paper tearing, or the sound made when you tune your TV to a nonexistent station, you are hearing noise. Tonal noise is generally more noticeable and more annoying than non-tonal noise of the same level. Whilst tonality can be judged subjectively, it will often be useful to measure it. This can be achieved through octave band, 1/3 octave band, or by narrow band analysis. In today’s car wash market, planning authorities are retrieving archived regulations targeting specific tones, separated into segments known as octave bands, within the overall dB rating. Although the averaged dB may meet requirements, specific octave bands within the spectrum can be deemed non-compliant. Standardized octave bands are groups of frequencies named by the center frequency where the upper limit is always twice the lower limit of the range. Test data for performance of acoustical materials is standardized for easy comparison at the center frequencies. Equipment noise levels and measurement devices (dB meters) also follow the preferred octave bands, reporting results in 1/3 octave bands. The advent of labor-saving express car washes means more tunnel equipment creating unwanted noise. The operation of a car wash dictates that cars will be passing through an open door soon after the drying process. The “open door effect” transmits noise to the neighbors. When a sound wave meets an obstacle, some of the sound is reflected back from the front surface and some of the sound passes into the obstacle material, where it is absorbed or transmitted through the material. For example, some of the sound in air that hits a wall will be reflected by the air to the wall surface. But of the sound that is transmitted through the wall, some will also be reflected internally at the wall back to air surface. Often that reflection is not considered, but it is a factor. If the surface that the sound wave hits is relatively smooth, more sound will be reflected than if the surface is rough. For example, more sound will be reflected (transmitted) from a smooth wall made of mud than a pile of dirt. The reason is that the rough or porous surface allows for many internal reflections, resulting in more absorption and less reflection. Tunnel surfaces typically are constructed of reflective, non-absorptive materials. Reflection can increase the amount of sound beyond the dB originating at the source (blowers). Consequently, facilities with employees must pay attention to prevent employee exposure limits in excess of OSHA regulations. Couple this with dryers located close to the exit, and an increase in the amount of noise emitted to the surrounding area is often noted. As sound travels through any medium, there is some loss due to absorption. Since sound is a regular vibration of the atoms or molecules in a material, some of the kinetic energy of the waveform is lost due to molecular collisions. That sound energy is turned into random heat energy. Some materials absorb sound more than others. Music recording studios use sound absorbing materials on their walls to eliminate any undesired or outside sounds, when recording a song. In the world of industrial acoustics, this means choosing materials with long fibers installed in a chamber with resultant compaction capable of withstanding moisture. The volume of sound traveling though air not only becomes less as it spreads out, but some of its energy is lost due to absorption. The rate of loss is a function of the frequency or pitch of the sound. Hence, the necessary practice of obtaining acoustic measurements at standardized distances from the source. To be acceptable, these readings must be reported in an acceptable 1/3 octave band format by a certified acoustic consultant. Prior to planning and preparing, I made a list of non-negotiables — performance, quality, and absence of maintenance. Experience as both an operator and a manufacturer factored heavily into decisions and goals. Baseline noise measurements of the current system were taken and evaluated under the same conditions as those of the improvements. Measurements must be made in an environment that does not have reflecting surfaces within 5 meters. The background noise level was at least 10 dbA below the measured level of the system in operation. In a car wash dryer, there are three major points of testing: the air intake, the air producer, and the air outlet. Calibrated audio recordings were required for each noise and performance point. Data was gathered, analyzed, and assessed for each point, then modifications developed for that point to reduce it below the subsequent points. We then continued to the next highest noise point, with likewise intent and practice, continuing in sequence. Modeling of airflow through the fan allows the flow needed to be visualized. This would be the first step in obtaining initial recommendations to modify a fan system with reduced noise and improved efficiency. 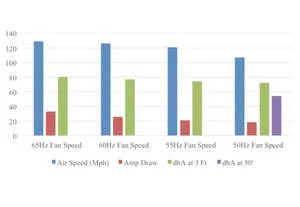 Noise is directly related to airflow efficiency. The correctly configured fan must be perfectly balanced; fan-tip clearance must be the same all the way around. Variations in tip clearance cause additional noise and also reduce fan efficiency. Great care must be taken to get the geometry as exact as practical. Even a 5 dB change is more than a 50 percent change in acoustic energy. The pressure associated with the loudest known sound is more than one billion times that associated with the faintest sound. Such a large range is unmanageable for measurement purposes. Using a logarithmic scale compresses the range to between 0 and 200 dB. dB sound pressure levels are unweighted. dbA levels are “A” weighted according to the weighting curves to approximate the way the human ear hears. For example, a 100 dB level at 100 Hz will be perceived to have a loudness equal to only 80 dB at 1,000 Hz. The dbA scale is based on a child’s hearing and was originally documented based on actual hearing tests to characterize the human ear’s relative response to noise. The challenge had been to provide compliance solutions for newly enforced tonal requirements in certain markets. Success. After four rounds of testing by international and domestic consultants in 2018, we were able reduce sound emissions by up to 15 dbA. The modifications included altering design of the intake, silencers, and changing the acoustic material while keeping the costs of the overall noise package to the minimum practical. Cheryl Dobie owns Aerodry Systems LLC based in Denver, CO. She formerly owned car washes in Texas in the 1980s and manufacturer Worldwide Drying Systems in the 1990s. For more information on this article or Aerodry, e-mail info@aerodrysystems.com.